We know what you're thinking: this had to have happened in Florida. 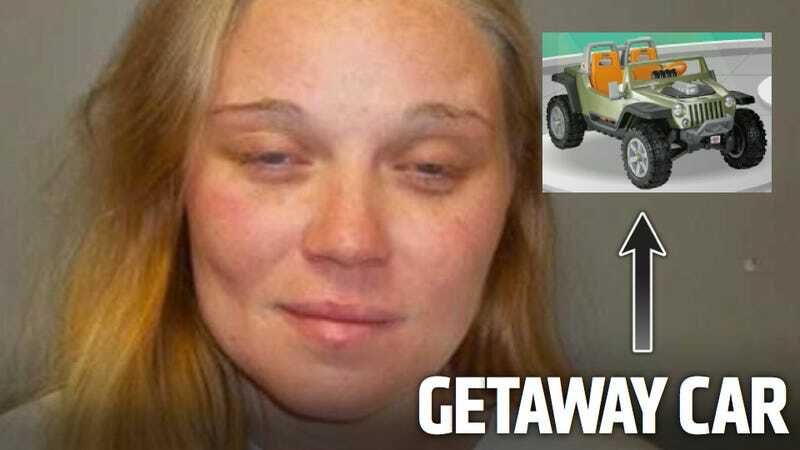 For once, a barefoot drunk woman with no pants on crashing her car into a trailer and trying to ditch the cops in some kid's Powerwheels didn't go down in the Sunshine State. It happened in the Natural State: Arkansas. When they finally did catch her (maybe the toy truck's battery died a little and slowed her down), police said Jamie Jeanette Craft was "irate." She had crashed her 2001 Pontiac Grand Am into the side of a mobile home, then, in an apparent panic over causing the accident, stole the Powerwheels for her getaway.